A Wizard's Wings by T. A. Barron. A Merlin Book. Review: It was said that the magical island of Fincayra's darkest day would, and now that it has, the haunting of the island and inhabitants including Dagada begins. Merlin and his friends are the only ones who can stop the end of the world by Rhita Gawr's hand. 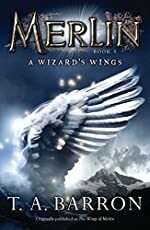 Will they succeed on their journey to save their world in the fifth book of the Merlin Series: A Wizard's Wings by T.A. Barron? Merlin, having attained wizardly powers and public acclaim, has once again brought peace to the island, but one stormy night Dagda himself warns Merlin of what is to come in one week on the Winter Solstice. Many problems arise including the escape of Stagmar and a rampaging murder is on the loose with swords for arms killing children demanding Merlin to come in combat. While Merlin is overwhelmed with problems, more come his way, one of which is the most difficult, and that is uniting the whole island's people. Will he succeed in these tasks or not? Will the world end? Merlin will fill the dreams of elementary and middle school students with courage, bravery, and happiness. This book has the aptitude to create suspense in a reader. Many parts include nail-biting marathons. Also included is the great fantasy, RE descriptions that takes you out of this world into the pages of this book's world. This book not only brings your imagination out, but it also brings out an understanding of real-life problems and their solutions. Recommended by The New York Times Book Review, School Library Journal, and others. A Wizard's Wings is an outstanding book. Inundated with many plot twists, this book can never be predicated making reading it an amazing adventure. Want more to read? Well no problem because A Wizard's Wings is in a series titled Merlin. Just get this book to fly into the pages of the saga. We would like to thank T. A. Barron for providing a copy of A Wizard's Wings for this review. Have you read A Wizard's Wings? How would you rate it?